This Chapter describes methods where surface run-off is collected and stored in dams, tanks, or cisterns, for later use. Detailed informa- tion is given in the proceedings of two workshops, both in Arizona (Frasier 1975, Dutt et al. 1981). An excellent review of the state of the art is Hollick (1982). · whether the catchment is in its natural state or treated in some way to increase the run-off. · losses of the stored water through evaporation, seepage, or' leakage. The number and range of the variables is so large that individual designs for every system would be laborious, but there cannot be standard solutions which will suit all conditions. The approach can therefore be either to use empirical experience, perhaps incorporated into design tables, as, has been done in Western Australia (Hollick 1975), or by using computer models, such as Frith et al. (1975) or Hanson (1975). Degradation of the grazing lands in the Sahel has led to increasing concern about the necessity for maintaining the right balance between the available water supplies, available vegetation for browse and grazing, and the intensity of use by livestock. A number of examples are reported of undesirable changes to the ecosystem resulting from making more water available by the development of underground sources (in Botswana by M.L. and M.J. Odell, 1980, in the Sahel by Wade, 1974, and by Sinclair and Fryxell, 1985). This danger is less likely in the case of harvesting surface water, but it is still a possibility. One water harvesting method which can make use of all the available rainfall without risk of ecological upset is the buried membrane system developed by Shanan et al. (1981). The idea is to provide small cattle-watering points with run-off collected from catchments where a plastic membrane has been buried just below the soil surface. The amount of water collected is proportional to the rainfall and so is the nearby vegetation. If the amount of stored water is deliberately kept small it runs out before the vegetation, and nomadic herds would he moved onto the next watering point before the vegetation is damaged by overgrazing. Two countries have a wide experience of water harvesting methods. These have been reviewed for North America, particularly Arizona, by Cluff (1975), and in Western Australia, by Laing (1981a). Summer rainfall in the semi-arid tropics usually includes short- duration storms of high intensity which give high rates and amounts of run-off. This is partly because the high rainfall intensity can tempor- arily exceed the infiltration rate, and also because the infiltration may be reduced by the formation of surface crusts, caused by the breakdown of structure from the rain, and the high surface temperatures, as shown in Niger by Valentin (1985). In Burkina Faso, Roose and Piot (1984) measured annual run-off rates of between 30 and 40 percent on overgrazed and cultivated land, but in individual heavy showers the run-off was up to 70 percent. In Australia, even small falls of rain (less than 15 mm) produced run-off equivalent to over 50 percent of the rain from land with low density vegetation (Pressland and Lehane 1982). In semi-arid areas with winter rainfall there is a higher proportion of rain in small amounts and at low intensities. However, infrequent high intensity storms can lead to heavy damaging floods even with a winter rainfall of less than 100 mm. The effect of the size of catchment area was discussed in Section 5.1.3. A small catchment will produce more run-off per unit area than a large catchment, and this is often made use of in the design and shaping of catchments, discussed in Section 6.2.2. Significant increases in the yield of run-off can sometimes be achieved by simple treatment of the surface, for example the removal of vegetation or moving stones on the surface. In the northern Negev, Israel, with an annual rainfall of 250 mm, removing the vegetation decreased the infiltration rate by 40-50 percent and increased the run-off from 7 to 21 percent (Tadmor and Shanan 1969). They also report a similar effect from Utah where reducing the vegetation from 40 percent to 16 percent cover increased annual run-off by about 60 percent. The reason for this effect is partly that the plant cover gives protection against the rain-drop impact and lessens the crusting effect, while the plant roots and surface litter increase the infiltration. Another simple method which also has the effect of increasing run-off through less obvious, indeed unexpected, hydrological processes is the removal of stones from the soil surface. In the studies of run-off farming in the Negev desert, which have been previously referred to several times, one subject for research was the large number of mounds of stones or lines of stones which cover large areas of the catchments supplying water to the run-off farms in the valley. A superficial analysis of the hydrology would suggest that, if the soil surface is covered with a significant amount of stones, the run-off from this impermeable surface would increase the overall run-off. However, detailed studies with experimental run-off plots over a number of years gave two results which the authors themselves describe as 'astonishing'. These are firstly that with few exceptions run-off is less on steeper slopes, and secondly that clearing the stones from the surface and piling them into mounds increased the run-off. For an explanation of the complicated hydrological processes, interested readers are referred to Chapter IX of 'The Negev' by Evenari et al. 1982, and these have recently been confirmed in laboratory studies by Poesen (1986). An obvious possibility for use as a catchment area is any naturally occurring rock outcrop, and there are worldwide examples of such use, particularly for domestic use and stock watering where the requirement is small quantities of good quality water. 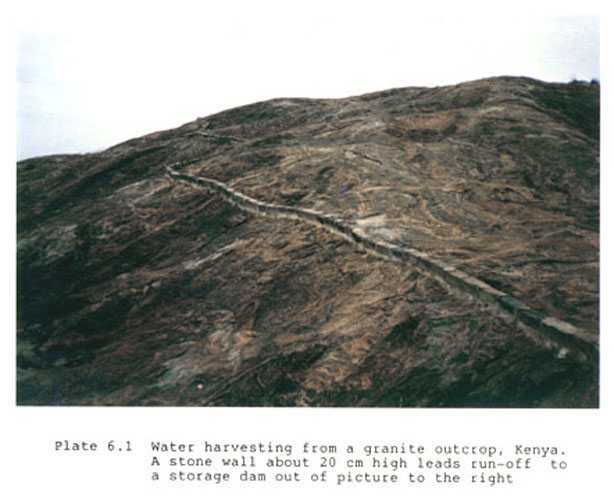 The geologically ancient Basement Complex formation often includes large granite outcrops which are traditionally used for domestic water supply in Zimbabwe (Richards 1972) and in Kenya (Plate 6.1). Similar schemes are found in Western Australia (Davies 1977, reported in Hollick 1982), in North America (Chiarella and Beck 1975), and also in India and Sri Lanka. A simple collecting channel is required, usually a low wall of brick or masonry. The coefficient of run-off is not always as high as might be expected from bare rock surface, and can go down to less than 50 percent due to losses from evaporation, surface depression storage, and losses through fissures and cracks. Limestones are usually weathered and fissured, and may yield as little as 25 percent, while a steep solid granite may yield 80 or 90 percent. The yield can sometimes be increased by sealing the fissures with cement or bitumen. Two water harvesting methods widely used in Western Australia employ a careful reshaping of the soil surface, and usually some further treatment of the surface to improve run-off. 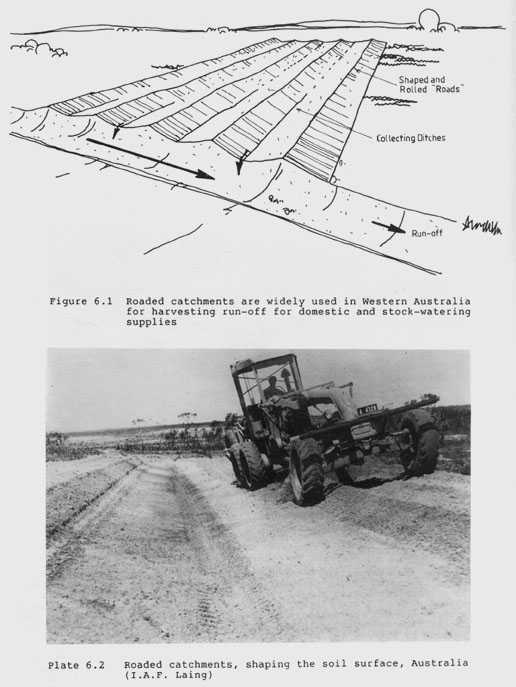 The principle of 'roaded catchments' is shown in Figure 6.1 and Plates 6.2 to 6.5. Shaping the land into roads gives more run-off by decreasing the losses. Smoothing out the land reduces surface depression storage, and evaporation and infiltration losses are reduced by running the water quickly into the storage tanks. Infiltra- tion losses may be further decreased by compacting the soil surface by rolling, or by spreading a clay blanket before rolling where the surface is sandy but clay is available. Several thousand roaded catchment systems are in operation in Western Australia, some on commercial livestock farms and others providing domestic supplies to villages and small towns. It was estimated that more than 3 500 were in use in 1980. In areas of annual rainfall of 300-400 mm, the proportion of rainfall that can be harvested varies from 24-41 percent, with an average of 35 percent. Water for town supplies may use bitumen to increase run-off but this is usually too expensive for farm use. As a result of this wide experience, detailed design procedures have been published (Frith 1975 and 1977, and Laing 1981b). Designs are also published by the Western Australia Department of Agriculture as Farm Notes 109/84 and 129/84, and a mathematical model for optimizing the combined cost of a dam and roaded catchment is available for graphical solution in Tech. Note 4/76 or computer solution (Frith et al. 1975). The method has also been used on a limited experimental basis in Arizona and Texas where the results are reported to be comparable to those obtained in Western Australia (Hollick 1982). The flat-batter dam, or spread-bank dam, is another water harvesting method, from the southern coastal area of Western Australia (Plate 6.6). Rainfall is about 400 mm but most falls at low intensities. The terrain is flat or gently sloping sandy soils overlying clay and, together with the low intensity rainfall, this makes roaded catchments unsuitable. 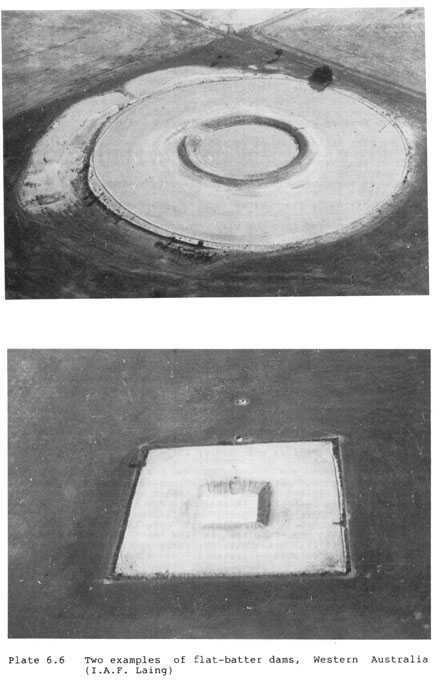 To construct a flat-batter dam, bulldozers and road graders spread the sandy topsoil to form a circular saucer around the proposed tank. Then the tank is excavated into the clay which is spread to a depth of 0.1 m over the sandy saucer to provide the run-off catchment. The inward slope is about 1 percent at the storage tank increasing to 2 percent at the outer rim. The catchment may be from 50-100 m in diameter. The run-off efficiency is comparable with that of roaded catchments, that is, up to 40 percent. This type of dam can be used on flat sites which would not ordinarily produce any run-off, and another advantage is that they can be sited on the top of any high ground so that the water can be distributed by gravity (Laing et al. 1980). A wide range of chemicals have been tried in attempts to increase the run-off by sealing the surface, and a thorough review of the methods tried is given by Hollick (1982), from which much of the material in this Section has been drawn. In addition to composition of the chemicals, other factors to be considered are the method and the cost of application, the lasting qualities of treatment, and maintenance to ensure that the treat- ment remains effective. All of these have to be costed, since few of the proposed or tested methods show signs of being financially suitable for agricultural purposes, although some may be justified when providing domestic water supplies. Several comparative performance tests have been carried out in USA (Frasier and Cooley 1979; Fink 1984; Fink and Ehrler 1981). One of the few methods with a long track record is the use of various types of sprays based on cut-back and emulsified bitumen or asphalt, which have been used in Australia for country water supplies for twenty years. There are problems of discoloration, although the contamination is odourless and tasteless. Care and attention to detail in the preparation and the application, and the need for monitoring and maintenance make it less attractive for agricultural use. Laing and Prout (1975) found that for most agricultural purposes compacted clay was more practical and economic. 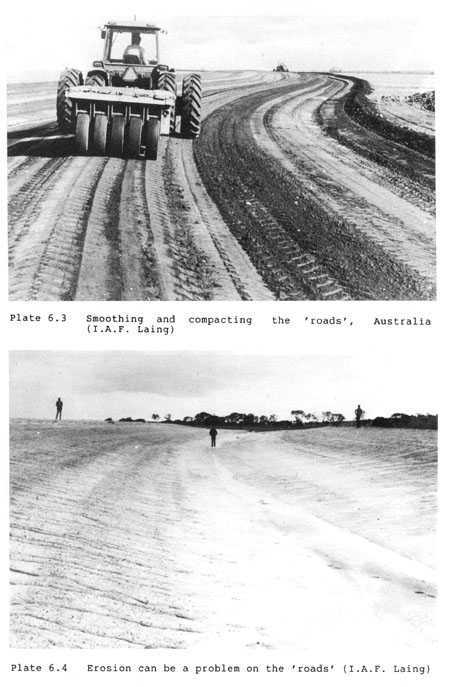 In a later study (1981b) Laing found that compaction alone yielded 40 percent of run-off, one coat of bitumen on compacted earth gave 65 percent, and two coats of bitumen after compaction gave 89 percent run-off. The choice of practice therefore depends on analysis of the costs and the value of the stored run-off. Another approach is to use water-repellant chemicals, for example waxes have been studied in detail by Fink in Arizona (1984) and silicones by Plueddemann (1975). Tests of many other hydrophobic chemicals are described by Hollick, but so far none have shown the required properties of being cheap and long lasting. An alternative way of reducing infiltration is to physically block soil pores on the surface. This can be done by adding bentonite, a very fine colloidal clay used for sealing the floor of leaking reservoirs, or mixing cement into the surface soil to form a soil-cement stable layer. Sodium salts have also been extensively studied, for example Dutt (1981) in the USA, and Karan and Julka (1981) in India. They deflocculate the soil so providing fine particles to seal the surface in the same way as bentonite. There are the usual difficulties of cost and the length of the effect, and they have another disadvantage in that the deflocculated soil is less resistant to erosion by the increased run-off. Membranes are also reviewed by Hollick (1982). They suffer the same disadvantages of chemical additives by being expensive in relation to their life. An approach which shows some promise, because nine experimental catchments gave a reasonable performance over twelve years (Myers and Frasier 1974), is the combination of a mat to give tensile strength with a sprayed emulsion to make it waterproof. Myers used fibreglass for the mat and several applications of asphalt, but a number of other combinations have been tried. Flexible membranes have also been used, particularly the polyethylenes and polyvinyls, and the synthetic rubbers, acrylic and butyl. The main problems with the plastics are that they tear easily and degrade quickly; butyl rubber suffers less from these problems but is too expensive for most uses. Rigid materials are also generally too expensive. Concrete mem- branes have been used and have a reasonably long life but they are very expensive and the run-off is suprisingly low at from 56-80 percent, probably because of the surface depression storage with subsequent evaporation, and the losses from cracks. Corrugated iron sheets have also been used, and do give higher run-off coefficients but the cost limits their application to collecting small amounts for domestic use such as from house roofs, or in Australia where they are the only effective cover which can be applied to the surface of shrinking and swelling black clays. A cheaper material is roofing felt which can be laid in strips with the edges sealed together. There have been a few applications in the USA but the material is too easily damaged and too short-lived to justify the cost. There have been several comprehensive and detailed studies of alternative methods, particularly in the USA. For example Chiarella and Beck (1975) studied about fifty catchments in Indian reservations using many different treatments and combinations. They came to the conclusion that success was very variable, and the main problem was failure resulting from lack of maintenance since no-one would accept responsibility on communal lands with shared use. A similar trial with similar results was made by McBride and Shiflet (1975), where again the problem was maintenance of communally-used facilities. Mickelson (1975) also reported tests of performance and durability of various membranes and chemical treatments, and in Pakistan a study was carried out with thirty catchment plots and ten treatments (Sheikh, Shah and Aleem 1982). The consensus of these and other trials suggests that technically there are a number of methods which, depending upon the soil and site conditions, can be made to work on an experimental basis. But the difficulties of cost and maintenance make it unlikely that any of the methods so far tested will be economic except in the particular case where small quantities of water are valuable because they are essential for stock or human consumption. The harvesting and use of water by storing it in dams, tanks, and other constructed containers is too big a subject for detailed treatment here. This section reviews the principles of the more common types of storage, and for more detail readers are referred to manuals listed with the references. Small earth dams are probably the most common type of man-made storage, and on favourable sites are effective and economical. They do require some care in design and construction, and they need regular maintenance, but there is a wealth of information and advice available in books and manuals at all levels (Hudson 1975). The first step in planning a dam is to define quite clearly the purpose of the dam, so that design requirements can be identified. For example, if a cattle-watering point is required in order to make use of grazing in a particular area, this means there is no point in looking for a site outside the defined area. If the water has to be available throughout the year, this means there must be a minimum depth so that water is always available after allowing for evaporation, but, on the other hand, the amount of water required for stock-watering will be much less than for an irrigation storage dam. When the purpose is irrigation this means the required amount of storage is defined, and also the period when the water must be available. When the purpose is clear, the consideration of the other following factors will be easy. · "Can the scheme be anywhere in the district, or is there a particular piece of land to be irrigated, and which the dam has to be near?" · "Is it a gravity scheme where the dam must be above the land? or can we pump from below?" · "Could we have the dam site upstream and bring the water down in the stream?" · "If the dam is at some distance from the scheme, would the supply canal have to be lined?" In order to plan the capacity of the dam, we need to ask "How much water will be used from the dam, and how much will the demand fluctuate through the year? What is the maximum demand? What are the consequences if the supply dries up? Is a carry-over from one year to the next necessary or desirable? What will the losses be from evaporation and from seepage?" The shape of the valley influences how much will be stored for a given height of dam wall. The ideal site has a long throwback, that is the surface of the stored water goes a long way back upstream giving a big capacity. It will also have steep valley sides at the dam site so that the earth wall is short. A valley with gently sloping sides means a long and expensive wall. If evaporation is high, it is better to have deep water and a small surface area rather than a large surface area of shallow water. Sites with a good basin storage are often found where the stream passes from a wide valley through a narrow gorge, or where the streambed changes from a flat to a steeper gradient, or at the confluence of two streams so that there are two storage basins for one wall. · soils containing a high proportion of fine silt. Few dams on streams and rivers can be built big enough to store all the run-off, and some provision is required to pass on the surplus flood water after the dam has filled. The spillway is the channel or pipe or waste-weir designed to do this. The cost of small earth dams is greatly increased if spillways have to be built of concrete or similar materials, so a major factor in site selection is looking for sites where the overflow can be safely discharged over grass-covered spillways. For small conservation dams one solution is open channel spillways cut into the bank at the side of the dam wall (Figure 6.2). These are cheap and effective, but there is a risk of erosion if the water flows too quickly. If it is possible to maintain a good grass cover, this greatly reduces the required size of spillway, but grassed channels do require careful design and construction and may be difficult to establish and maintain in areas of poor rainfall. It is wise to limit the maximum size of catchments for dams with grassed spillways to 500 ha in semi-arid areas. The most vulnerable point on cut spillways is where the water rejoins the stream. To prevent erosion at this point (A in Figure 6.2) the stream bank must be cut back to a gentle slope and planted with grass like the rest of the spillway. Alternatively, a concrete or masonry drop structure may be provided at this point. It is undesirable for grass spillways to be constantly saturated. This makes them more vulnerable to erosion because the types of grass which are best for spillways do not like continually wet conditions. So if a stream is likely to have a small constant flow, or one which continues a considerable time after each storm, a trickle flow outlet should be provided. This can take the form of a small brick-lined or concrete channel set in the spillway, or it can be a small diameter pipe going through the dam wall, preferably on the opposite side of the stream from the spillway. If it is not practical to protect a cut spillway with grass, it may be necessary to protect it, or perhaps the most vulnerable parts, with stone pitching or concrete. These are used where the site conditions make it possible to divert the flood flow into a naturally existing waterway or channel. 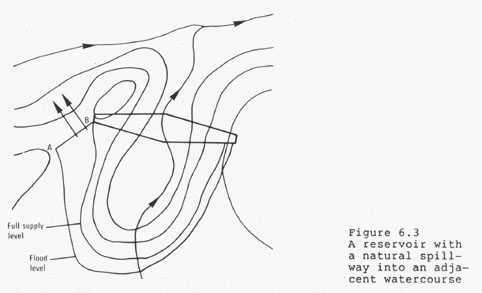 Figure 6.3. shows an example where the flood is diverted over a crest into the adjacent valley. The crest should be approximately level between A and B so that the flow is spread out, and the slope down to the stream should be gentle and have enough grass cover so that there is no risk of erosion. These use pipes to pass the flood through the embankment. It would not be practical to have the pipe large enough to pass the maximum peak flow, so temporary flood storage is provided above the pipe outlet. This fills up during the height of the flood, and discharges through the pipe after the peak flow has passed (Figure 6.4). An emergency spillway is also provided for the exceptional floods. The capacity of mechanical pipe spillways is shown in Table 6.1. 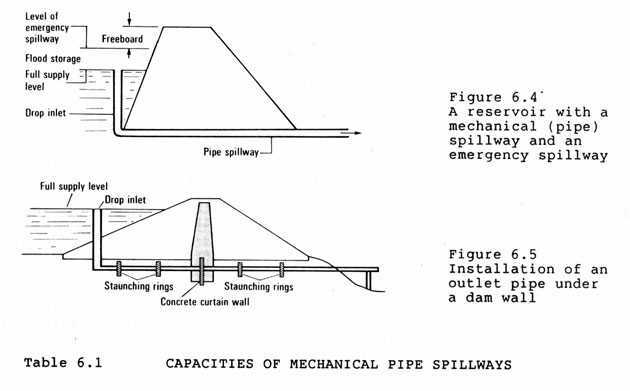 Drop inlets are often used at the entry to pipe spillways, partly to ensure a good discharge through the pipe and partly so that the pipe can be buried below the dam wall, as in Figure 6.5. · the material must be properly placed and compacted. The best way is to place the clay in thin layers, add enough water to make it plastic and to 'puddle' it, that is, to compact it by labourers ramming it with poles. Another good method is to drive cattle, oxen, or buffaloes up and down over each layer of clay. When using earth-moving machinery, the soil should be placed by a scraper in thin layers, and compacted when wet by wheeled tractors or by sheepfoot rollers. Placing the soil by bulldozer is not satisfactory, nor is compaction by tracked tractors. The embankment walls must slope inwards at an angle which will be stable at all times. Saturated soil is less stable than dry soil, so the water side of the wall has to be flatter than the downstream side. For most soils the slopes should be not steeper than 3:1 on the upstream side and 2:1 on the downstream. For soils approaching the ideal mixture of grain sizes and which are carefully placed and well compacted, the slopes could be increased to 2:1 upstream and 11/2:1 downstream. Soils which will be difficult to compact should have slopes of 3:1 or 4:1. For small dams the slope does not make much difference to the total costs, so if there is any doubt a flatter slope should be used. The top of the dam wall must be wide enough for both the construc- tion equipment and for any traffic if the wall is going to be used as a bridge. Unnecessary width will add to the volume of earth-work required. If the wall will only carry foot traffic and bicycles, 2 m will be enough, but for vehicles a minimum of 3 m should be allowed. No matter how carefully the earth is placed and compacted, there will be settlement over the years, and an allowance must be made for this. For average soils with reasonable compaction 10 percent should be added to the finally required height. This means that the newly built wall will be convex along the top as the allowance for settlement will be greater in the middle than at the ends. Embankments built without consolidation, for example those built by bulldozers, are not recommended, but if this method of construction is unavoidable the allowance for settlement should be 20 percent. The limits of the wall at ground level should be staked out, and all trees, shrubs, and roots removed. Next the grass, grass roots, and topsoil should be dozed off to a depth of about 100 mm. This material should be stockpiled just clear of the site on the down stream side as it will be used at the end of the job to give a dressing of topsoil over the whole wall. The areas from which soil is to be taken for the embankment should be within the area to be flooded as this increases the capacity, and also avoids bare areas which would be liable to erosion. The borrow area should be near the wall to reduce the haul distance, but not closer than 10 m or seepage under the wall may be increased. The topsoil should be bulldozed off the borrow areas, and stockpiled like the topsoil from the dam wall site. It is always difficult to consolidate earth placed around a pipe already in position. The best method is to put the pipe in undisturbed soil under the dam wall, as shown in Figure 6.5. The joints in the pipes must be made carefully and checked for watertightness as leakage would threaten the security of the dam. The staunching rings both hold the pipe in place and also prevent seepage along the pipe. They are cast directly against undisturbed earth, that is without using formwork. If the wall is to have a clay core, the pipe can pass through the core trench, with a concrete curtain wall as shown in Figure 6.5. The rules for placing the soil of the embankment are the same as for the core, that is, it should be placed in thin layers, and well compacted. Adding water may assist the compaction, but this is a refinement not usually necessary on small dams. Placing soil by bulldozer is always undesirable, because it will not be properly compacted. The embankment should be given a thin cover of the topsoil removed from the site of the embankment and from the borrow pits, and then planted or sown with a suitable grass. The crest and the downstream slope should have a good tough dryland creeping grass, and the upstream side one which will tolerate occasional drowning. The spillway and training wall should also be carefully grassed, and given other protection as required, such as stone pitching. 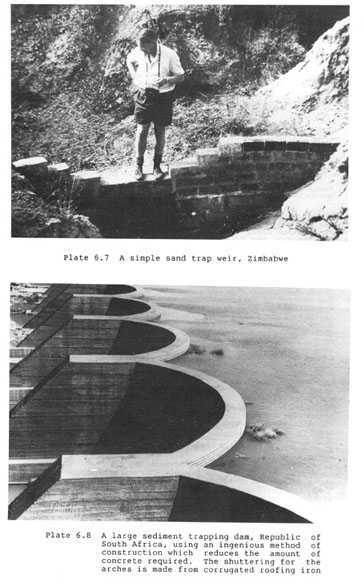 It is always sound practice to fence off the embankment and spillway, and if cattle will water at the dam it is preferable to fence off the whole dam and to pipe water to a drinking trough below the dam wall. · when the object is gully control, or to trap sediment. The main types of weir are shown in Figure 6.7. Gravity weirs depend solely on weight for their stability. A symmetrical section (Figure 6.7a) can be used, but the section in Figure 6.7b gives the same height with less material and . For weirs not built in steps (Figure 6.7c), the back slope is at 2 horizontal to 3 vertical. · wall height 1.5-2 m, crest width 0.5 m.
The weir can be entirely concrete, as in Figure 6.7c, formed by pouring concrete into wooden shuttering. 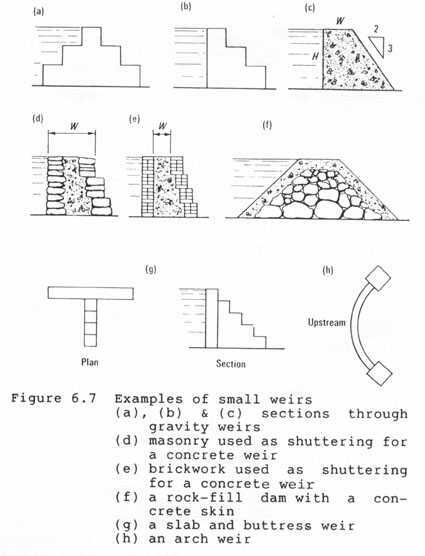 Alternatively, masonry can be used to form the outside layer and act as the shuttering, as in Figure 6.7d. Brickwork can also be used as shuttering as in Figure 6.7e. Another kind of gravity weir is the rock-fill dam (Figure 6.7f), in which a pile of rocks and boulders gives the stability, and a concrete skin makes it watertight. The large amount of material necessary for gravity weirs can be reduced by slab-and-buttress weirs (Figure 6.7g), or arch weirs (Figure 6.7h) In the slab-and-buttress, the vertical slab is held up against the pressure of water by the buttress, and in the arch weir the pressure of water is resisted by the buttresses at each end. Both these kinds of weir can be built of concrete, brick, or masonry, and can be built up to a height of about lm without design calculations. An engineer should be called in for larger weirs, or in cases where failure would cause serious damage. The essential requirement for all weirs is a solid rock foundation extending the full width of the stream channel. Building weirs on poor foundations or on a rock bar which only goes halfway across may be possible, but should be left to engineers. The first step is to clean off thoroughly all dirt and soil, chip off any loose or cracked rock, and if the surface is worn smooth by the water it should be roughened by chipping. To get a good bond between the foundation and the concrete, a grout (cement and water mixed to the consistency of thick cream) is brushed into the rock surface. Brick masonry shuttering is built using a mortar mix of six sand to one cement (by volume) and all joints should be completely filled with mortar. The concrete of a gravity weir does not require great strength, but this should be obtained by the use of an economical mix of good materials, rather than the use of poor materials. The cement should be fresh, and the sand should be clean and free from soil, dirt, and organic matter. River sand is quite suitable if clean; if not, it should be washed. Coarse stone aggregate must be clean and free from soil and dirt. Ideally, it should be a graded mixture of stones from 2 mm to 50 mm. River washed pebbles and gravel are suitable if clean. A suitable mix is 1 part cement by volume, 3 parts sand, 6 parts stone. The quantities required per cubic metre of concrete are 0.15 m3 cement, 0.5 m3 sand, 1 m3 stone, and 70 l of water. The order of mixing is not the same for mechanical mixers and mixing by hand. For mechanical mixers the stone is put in first, then the sand, then the cement, and then the water. For hand mixing, the cement and sand are throughly mixed dry, then the stone, and finally the water. It is not necessary for water storage to be in the form of free water open to the atmosphere. Sand can store substantial quantities of water in the voids between the particles if they are not filled by smaller particles. A coarse sand of uniform size could store up to 45 percent of its volume as water within the sand. The sand in river beds usually has a mixture of grain sizes but may hold up to 30 percent water, of which about half would drain under gravity. The fact that apparently dry sand river beds contain water at accessible depths is known and exploited by all dwellers of the deserts, both human and animal. The volume of sand trapped behind a weir will depend on choosing a suitable site, and the storage capacity can be increased over a period of time. If the weir is built progressively in stages of about one metre, the flood will deposit coarse sand behind the weir, but the silt and clay will be carried over the weir by the flood. A second stage can then be added to the weir to trap a second layer and so on progressively to the required height (Plates 6.7 and 6.8). This technique has been used on rivers in the Kalahari desert in Namibia and Botswana in southern Africa, and some of the schemes supply sufficient water for small townships by pumping from a number of linked well points. · by installing a pipe through the weir, a supply of clean piped water can be supplied downstream from the weir. This practice is also used in Latin America where silt trap dams are known as 'trincheras', and in Mexico large traps are encountered called 'atajadizos'. In some situations it may be impractical to build storage works directly on the stream, and in such cases the answer may be off-stream storage, that is, a storage reservoir which is filled by diverting water into it or by pumping. Off-stream storage is usually more expensive because it loses the advantage of the storage capacity in the stream channel, so it is likely to be used for purposes which justify the higher cost, such as stock watering or domestic use. For cattle watering, the advantage of off-stream storage is that it can be sited exactly where it is required - in a particular paddock, or near a borehole. 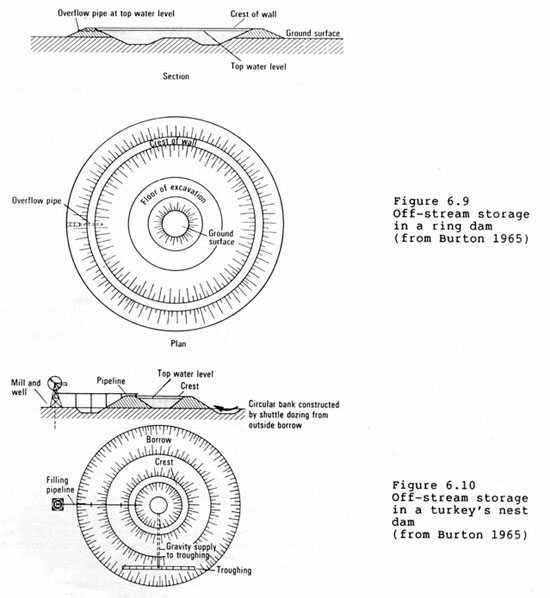 A special form of off-stream tank storage with its own built-in catchment is the flat batter dam described in Section 6.2.2. The cost of the water is mainly influenced by the ratio of the volume of storage capacity divided by the volume of excavated earth, known as the storage/excavation ratio or S/E ratio. Just digging a hole and storing water in it would give an S/E ratio of 1.0, but this can usually be increased by using the excavated soil to form a surrounding bank to contain water above the original ground level. A naturally occurring depression may also lead to a good S/E ratio. Several shapes have been worked out which give the best S/E ratio for different conditions. When choosing the best size and shape it is necessary to consider the slope of the ground, the kind of water supply, and the use for the water. Earth-moving equipment, which can be used for construction on off-stream storage dams, includes towed scrapers as used for earth dams, and also bulldozers and drag-line excavators. Simpler methods include metal scoops drawn by tractor, oxen, or other draught animals. Prodigious feats of earth-moving have been accomplished in China using wheelbarrows, and in many Asian and African countries by head-carrying earth in baskets. The storage of water in tank dams is a very ancient practice, and widespread in most semi-arid areas. Throughout Arabic-speaking northern Africa they are called 'hafirs', which may be either water holes in natural depressions, or where the capacity has been increased by excavation, with the spoil used to build a containing bank. Lead-in channels to increase the catchment area are also used. In former times the hafirs were carefully managed, with fences to exclude stock and avoid trampling of the bank, the water being supplied to a drinking point through a pipe. It has been suggested by Sandford (1983) that this style of careful management is only found where the use is limited to a single tribe or group, and that where this no longer applies as a result of social change, the maintenance declines and the hafirs become damaged and silted up. He cites the case in Kenya where, of the hafirs built in north-east Kenya after 1969, most are silted up because no group would maintain them in the face of the policy that they should be open to everybody. In India also, the use of off-stream scorage is widespread in what are called 'tanks'. It is quite common for them to have sophisticated water control as in the inundation tanks and khadins described in Section 5.3.5, and the tanks are frequently multi-purpose, being for combinations of domestic use, stock consumption, fish production, and irrigation. Deep water pools are sometimes provided within the tank so that fish can survive between rainy seasons, with no fishing permitted in these sanctuary pools. This is the best shape for gently sloping land and can give S/E ratios of 1.5 to 2.5 (Figure 6.8). Catch drains pick up surface run-off, and when the reservoir is full any surplus is spilled safely through overflows in the catch drains. These are also called tank-dams. Small sizes for stock watering can be built economically using either a drag-line excavator, or a small farm tractor and scoop, or by hand. On flat, or nearly flat ground, better S/E ratios are obtained from round tanks rather than square tanks (Figure 6.9). Because of the geometry of this shape, the S/E ratio increases with size, being about 1.5 for a 50 m diameter tank holding about 35 000 m3 to 4.5 for 200 m diameter holding 200 000 m3 . · where it is convenient to be able to distribute the water by gravity. The S/E ratio is poor, from 0.2 at 200 m3 to 0.4 at about 5000 m3, and the main use is as an alternative to corrugated-iron storage tanks for small quantities of pumped water used for stockwatering. The storage of water in excavated underground tanks or cisterns is another ancient and widespread practice. It is a traditional method in Mexico and was an essential component of the ancient desert farming of the Negev desert (Evanari et al. 1982). A modern variation was tested and developed by the Intermediate Technology Development Group in the Sudan and in Botswana (ITDG 1969). The principle is to excavate a cistern or tank, and line it with simple building blocks called 'sausages' which are made by filling plastic tubing with a mixture of sand and cement. The sausages are placed in position while dry and flexible and later set to form a rigid wall. Plastic sheeting is also used to make a waterproof membrane liner on the outside of the plastic sausages (Plate 6.9). This is an example of the successful application of intermediate technology, that is, using the product of advanced technology (the plastic tubing) in a very cheap and simple construction method which requires a minimum of tools and equipment. While undoubtedly a brilliant concept which has been shown to work technically, it has not spread dramatically, as one might expect. Possibly the reason is one commonly encountered; that the peoples of semi-arid regions are accustomed to a precarious way of life, often nomadic, and are reluctant to adjust to the concept of methods and systems which require maintenance. The main causes of loss of stored water are seepage through a leaking basin or dam wall, and evaporation from the surface. Many methods have been developed for controlling both, but few are economically attractive. The subject has been extensively studied in the USA and in Western Australia, with good reviews of the state-of-the-art by Laing (1975) and Hollick (1982). Losses from seepage can, to some extent, be reduced by site selection, avoiding sands and gravels. The Australian experience suggests that it is often cheaper to build a new storage tank on another site than to try to correct seepage in an existing tank (Laing 1975). A cheap method which sometimes works is to increase the compaction of the reservoir basin by working it while moist, either by driving wheeled tractors round in the basin, or herding livestock. Sheep in Australia and cattle in Africa have been used to puddle the soil surface in the same way as compacting the clay core of an earth dam (Section 6.3.l.iv). Part of this effect may be the result of droppings from the animals, and the practice of carting in additional quantities of manure to be worked into the surface is reported from South Africa and Missouri. Other chemical additives are used. One type relies on defloccula- tion to disperse the aggregates and seal the pores. Sodium salts or polyphosphates are used. A colloidal clay marketed under the trade name 'Bentonite' has a flocculating effect from its sodium salt content, and also disperses to fine particles which have a sealing effect. Chemical additives are usually only economic if cheap local supplies are available. The amount required varies according to the soil and should be determined from soil tests for example a well-graded soil will require about 5 kg of Bentonite per m2 up to 20 kg on sandy soils. The surface membranes, discussed in Section 6.3, for improving run-off from catchments are all possible solutions to reducing seepage from dams, with the same general conclusion. Thin cheap membranes like the polyethylenes are not sufficiently robust or long lasting, while the stronger and more durable materials like butyl rubber are too expensive. To some extent evaporation losses can be reduced by management. If the surface area can be reduced by increasing the depth, this will both reduce the evaporating surface and also lower the incoming radiation and the heating effect. The surface area can also be reduced by storing the water in a compartmented reservoir, and pumping the water from one compartment to another as the water is used, so that there are some full compartments and some empty, instead of a single shallow sheet when the reservoir is partly used (Cluff 1981). Reviews of the alternative methods of supressing evaporation in Arizona and in Australia arrive at different views of the probability of it being worth while. In Australia, Laing and Pepper (1976) conclude that the cheapest solution is to increase the volume of storage to allow for evaporation. On the other hand, Cooley (1975) felt that some methods could be economic, particularly floating covers and the provision of shade. Shading the water surface can substantially reduce the evaporation. Crow and Manges (1967) showed that a plastic mesh which gave only 6 percent shade reduced the evaporation by 26 percent, while a mesh which gave a 47 percent shade reduced evaporation by 44 percent. However, suspending nets or branches over the water surface is expensive, and no floating mesh has yet been successful. The method which was thought to have great promise when it was introduced in the nineteen fifties was the use of chemicals which have the ability to form a film on the water surface which is only one molecule thick, but substantially reduces the evaporation. One such chemical was cetyl alcohol. The problem is that the film is easily broken and dispersed by wind and wave action, and the method is little practised today. Another approach has been to use a more robust surface film and possibilities tested include floating covers of expanded polystyrene or rubber (Dedrick et al. 1973), and other floating materials such as blocks of lightweight concrete or floating plastic spheres. All of these can be successfully demonstrated on small experimental tanks and ponds, but have not been adopted for general use. 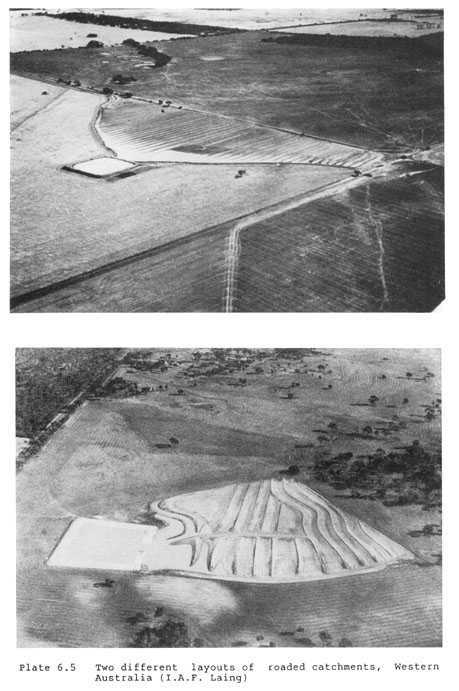 Storage of water within the soil profile was discussed in Chapter 5, and storage using structures and in sand rivers was discussed in Section 6.3. This section is about deep storage and extraction. The possible sources of water for recharge are spate flows in streams and rivers, run-off collected by furrows or channels, and run-off stored in tanks or dams. · good hydraulic conductivity is required: the rate at which water can be abstracted from or recharged into the rock depends upon its hydraulic conductivity. Two problems which may occur with recharge are salinity and silting. Storm run-off and flood water in streams and rivers are usually low in salts because of the dilution, although there are cases of semi-arid saline soils where even the flood run-off is saline. The more common problem of salinity is where raising the water table brings up saline groundwater to within the reach of wells or plant roots. Silting may be a problem because the flash run-off in semi-arid areas usually carries a heavy sediment load which is likely to block the soil surface and reduce infiltration. Siltation tanks are commonly used to reduce this problem, for example, in the systems of recharging groundwater in the San Joaquin Valley in California. The methods of water spreading discussed in Section 5.3 may be used also for groundwater recharge, either by carrying run-off to an infiltration zone, or it may happen almost accidently by seepage through the bottom of canal. Accidental seepage from canals may be beneficial where a rise in the water table is helpful, but it can also lead to undesirable results by causing waterlogging or salinity problems. If there are aquifers, such as gravel beds, at moderate depth below the soil surface the basin method may be employed. This consists of excavating basins to a depth which extends into the aquifer, so that the basin may be filled from a canal and then left to seep into the aquifer, and then filled again. The inundation tanks or khadins described in Section 5.3 are primarily intended for wetting the soil profile in the floor of the tank, but they have a subsidiary recharge effect, which improves the yield of shallow wells downstream from the tank. When the basins are specially built for groundwater recharge, it will be necessary to avoid them being choked by sediment in the water. Silt-trap tanks may be used, or another method is periodically to remove a shallow layer from the soil surface in the basin. Another variation, when the aquifer is too far below the surface for the basin system, is to discharge the water into shafts or wells excavated into the aquifer. In this case it is more difficult to correct the effects of choking by sediment, although it can be done by back-wash pumping. A better solution is to use water which is free from sediment. We referred in Section 2.2 to the danger of ecological damage resulting from the over exploitation of groundwater resources, particularly fossil water, i.e. water of ancient origin which cannot be replaced. The risk of this happening in arid and semi-arid areas is now increased by the effectiveness of the methods which are available for locating underground water. At the largest scale, satellite imagery is increasingly useful for interpreting the geomorphology, and identifying general areas likely to be suitable for exploration. At the next scale, aerial photographs allow a more detailed study of the hydrogeology, and finally the geophysical survey for particular sites nowadays uses sophisticated techniques including seismic, electromagnetic, and resistivity. All these techniques have been greatly improved in recent years as a result of increased interest in oil exploration. The exploitation of groundwater for the emergency relief of drought may offer temporary relief while the search for a long-term solution continues. An example of this comes from Zimbabwe. In an emergency programme, 282 small boreholes equipped with hand pumps were installed in six months, and another 40 sites located for hand-dug wells. Electromag- netic and resistivity methods were used for siting, with computer analysis in the field, and this gave a success rate of 90 percent (Houston 1985). Shallow groundwater may be exploited in the same way as sand rivers (Section 6.3.4). Gravel beds in flood plains or river banks are a useful source, and there is the probability of recharge using flood water. Shallow wells are a very common way of using groundwater. In India a common design is a stone-lined circular well up to 10 or 15 metres in diameter and similar depth, or rectangular wells of similar capacity. This large capacity is required because both the clay soil and the underlying rock have a low hydraulic conductivity. The well is emptied each day by domestic use, stock watering, and small-scale irrigation, and isreplenished overnight. This traditional method has been successfully operated for centuries when the water was lifted by hand or ox-power, but in some districts the widespread introduction of first diesel-engined pumps and more recently electic motors has meant that the water can be removed much more quickly. This has led to searches for increased capacity and delivery. In the Deccan Plateau, a common device is to drill small bores (30-50 mm) radially and horizontally outwards in an attempt to tap more faults and fissures in the rock. 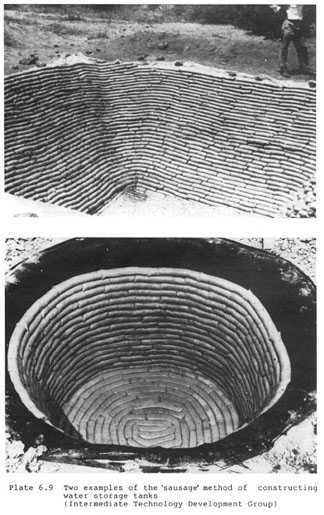 The same technique of increasing the yield of wells is used in Iran where the horizontal collectors are shafts or galleries driven by hand labour. Simple water-lifting devices are reviewed by Kennedy and Rogers (1985). 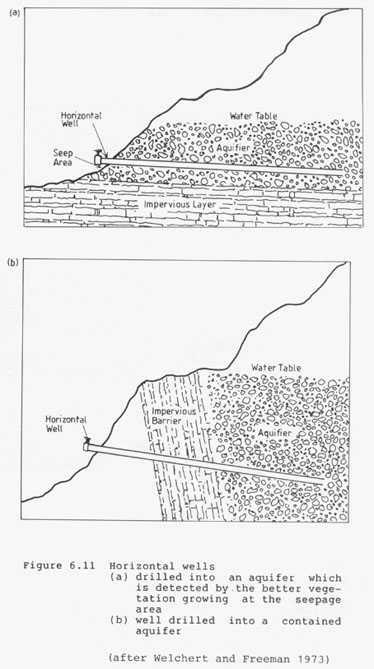 Another type of horizontal drilling is used in the western United States of America (Welchert and Freeman 1973) to supply small quantities of water for watering stock. These horizontal wells are also called 'cased springs' because they seek to develop existing springs, as shown in Figure 6.11(a) or to release contained water as in Figure 6.11(b). Using special drilling equipment a hole is drilled horizontally and a metal casing of 50 mm diameter is inserted. The pipe is sealed into place and fitted with a valve so there is no danger of contamination. The hole is drilled at a slight downward angle so that the pipe remains constantly filled with water and flows out under the head in the aquifer. This is a modern development of the age-old system of driving a horizontal shaft into the side of a hill until it reaches the water table, so that water then flows out through the tunnel under gravity (Figure 6.12). This method is widespread throughout northern Africa and western Asia. In Afghanistan and Pakistan they are called 'karezes', in north Africa 'foggaras', in the United Arab Emirates 'falaj', and in Iran 'qanats'. It is estimated that in Iran there are 40 000 qanats with a total length of 270 000 km and supplying 35 percent of the water supplies of the country, mainly in areas with mean annual rainfall of 150-250 mm. The entire water supply for the 2 million population of the city of Teheran was supplied from qanats until recently, when a storage reservoir was built. The construction of qanats was extremely arduous and dangerous, and few are excavated nowadays, although hundreds of thousands are in everyday operation. It seems possible that using modern techniques of tunnelling, with acceptable safety standards, it should be possible to develop a present-day version of this ancient and successful method.